I look forward to harvesting elderflowers and making this refreshing preparation in June / July wherever I am, as elder trees are abundant in both the UK and France. In any case it will be a celebration of what I have learnt in London. I made this cordial in June/July 2013 with elderflowers picked with Abundance Wimbledon. Right: pure cordial, to be bottled. Centre: a glass of water with a hint of cordial proved to be an amazingly refreshing drink. Photo 9th July 2013. I was given two recipes, one of elderflower champagne and one of a cordial with lemon and orange. I chose the latter, which you can read on the BBC website here. 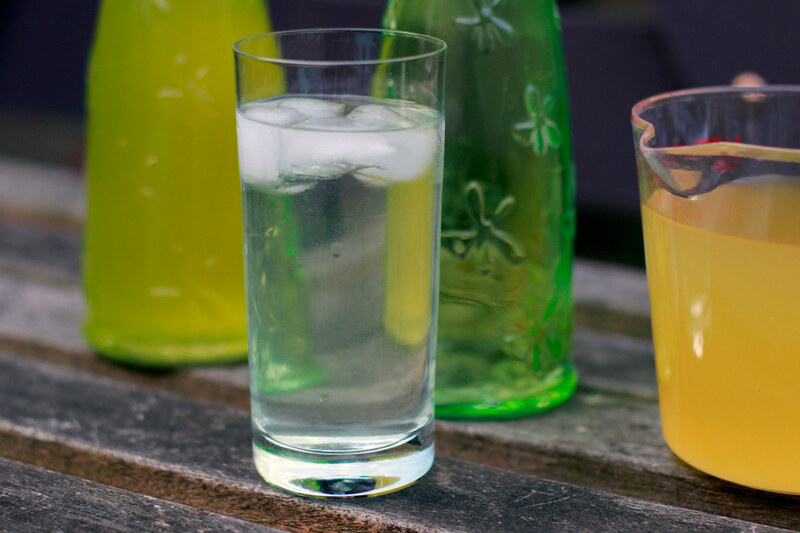 So… thirty elderflower heads, 1.7 liter of water, 900g of sugar, 50g of citric acid, three lemon and two oranges, sliced. This is for the ingredients. Put the lot in a large saucepan and leave it in the fridge to infuse… strain it through a muslin and that’s it. Ready to be bottled. Something I wouldn’t do: rinse the flower heads, as some of the fragrant part would be lost (choose heads with yellow pollen in the multitude of tiny flowers which form them). Two things I would do: leave the mix to infuse for several days, for instance three or four, so that the cordial gets more fragrant. And use a masher to get more out of the lemon and orange flesh and skins. We kept the cordial for several months in the fridge, and tested it at several levels of concentration with fresh water. The less cordial you put in a glass of water, the more refreshing the drink is. The first time we shared this cordial was at the London house of a South African gentleman and his Austrian wife on 11th July 2013. Around the table also sat a Scottish woman, a former Mayor of Merton and her husband who are both British, and us, two French residents in the UK. In other words we went beyond France and the UK, as the recipe itself does, using citrus fruit to complement local produce. I am thinking of places where citrus and oranges grow, I hope they have surplus fruit sharing initiatives like ours. Maybe they import ingredients from remote countries too that complement well their own cordials. The outdoor meeting on a sunny summer evening between adepts of local fruit sharing projects and new comers would lead to the creation of Abundance Southfields in September 2013. I wouldn’t say that the cordial was instrumental to the success of this meeting, but it was surely a bonding element. People also liked the shape and colours of the bottle and its content, yellow and green contrasting with the transparency of the drink and the ice cubes in the glasses, on our hosts’ white painted iron garden table. The sounds were quite nice too, in this quiet South-West London garden, and I will remember the smiles. Smiles of people, some of whom meeting for the first time, sharing experiences and building for the future of community life in the area. Only shadow in the picture of this otherwise delicious moment, many cherries in the garden of Richard’s neighbour hadn’t been picked. This year they won’t be lost, hopefully. This entry was posted in Eat, Stories and tagged Elderflowers, Southfields, UK, Wimbledon by Les Jardins d'ici. Bookmark the permalink. Super Jean Jacques… Excellente idée ,c’est vrai qu’il y a des fleurs de sureau partout l’été…! J’espère que tout se passe bien in London… Ici c’est le printemps…! Grosses bises a tous, Babette.